In 3-quart saucepan, heat oil over medium heat. Add onion and tomato; cover and cook 5 minutes or until onion is translucent and tender. Stir in quinoa and garlic. Cook 3 to 4 minutes or until grains begin to become translucent and brown slightly (they will still be undercooked). Stir in salt, pepper and paprika. Add water; cover and cook 15 to 20 minutes longer, stirring occasionally, until most of liquid is absorbed. Remove from heat; let stand 5 minutes. In medium bowl, beat eggs and milk with whisk until well blended. Stir into quinoa mixture. Add 1 1/2 cups cheese; stir to combine. Pour mixture into baking dish. Bake 30 to 35 minutes or until edges begin to brown. 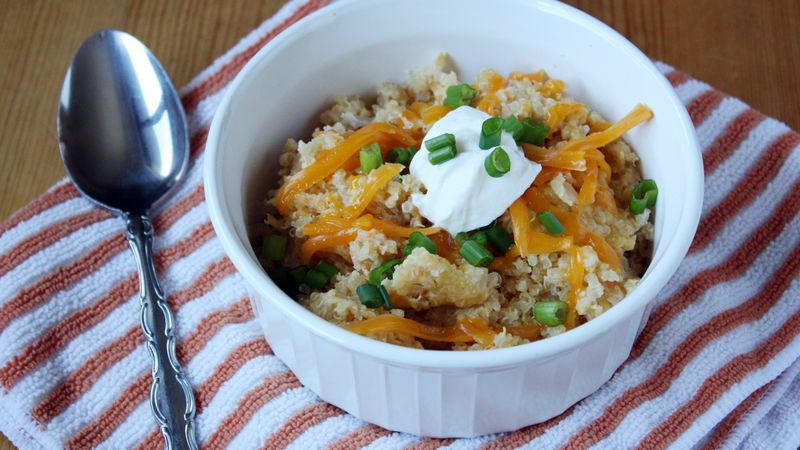 To serve, spoon into individual serving bowls; top with additional cheese, sour cream and green onions. Not a tomato lover? Substitute an equal amount of green or red bell pepper for the diced tomatoes. Go cheese-wild—substitute shredded Gruyère, mozzarella or your favorite cheese for some or all of the Cheddar.